The loup cervier, lucivee, and Indian devil are all names used by old-time Maine woodsmen for the elusive Canada lynx (Lynx canadensis). Although lynx are similar in size and appearance to bobcats, lynx appear larger because of their long legs. The most distinguishing characteristic is the lynx unusually large, densely furred feet that help them travel over snow. Both lynx and bobcats have black tufts of fur on their ears and a short, black-tipped tail, however, lynx have long ear tufts and a completely black tipped tail where bobcats have short ear tufts, and the tip of their tail is black on top and white underneath. A lynx winter coat is light gray and faintly spotted, and the summer coat is much shorter and has a reddish-brown cast. Adult males average about 33 1/2 inches long and weigh between 26 and 30 pounds. Females are about 32 inches long and weigh between 17 and 20 pounds. Lynx are common throughout the boreal forest of Alaska and Canada. The southern portion of their range once extended into the U.S. in the Rocky Mountains, Great Lakes states, and the Northeast. Today, resident breeding population of lynx are found in Montana, Washington, Maine, and Minnesota and lynx have been reintroduced to Colorado. This forest-dwelling cat occurs in northern latitudes where deep snow and spruce/fir forest are common. In Maine, lynx are most common in the spruce/fir flats of Aroostook and Piscataquis counties and northern Penobscot, Somerset, Franklin and Oxford Counties, where snow depths are often the highest in the state. Although lynx are more common in northern and western Maine, lynx have begun to expanding into eastern sections. In March, male lynx increase their movements in search of mates. After a 60-65 day gestation period, female lynx give birth to kittens in May. In Maine, lynx have produced litters of 1-5 kittens in dens consisting of a depression under thick young fir trees or elevated downed logs. Kittens are raised by the female, who occasionally leaves the den to hunt. Kittens are able to travel with their mother by early July, and stay with their mother until the following spring. Lynx are highly specialized to hunt snowshoe hare, which comprise over 75 percent of their diet. Lynx consume one or two hares a day. In the summer, the diet is more varied and may include grouse, small mammals, and squirrels. Although lynx were once considered nocturnal, lynx are actually active during both day and night. Males are solitary for most of the year except the breeding season, they share their area (e.g., home range) with other female adult lynx. Females and their kittens (family groups) hunt together to increase hunting success. The size of a lynx home range can vary with snowshoe hare density, habitat conditions, and season. In Maine, male home ranges are twice as large as a female’s home range and are equivalent to half a township (18 square miles). Adult female lynx share their entire range with a male and a male may share portions of his home range with 1 to 3 adult female lynx. Currently, Maine is the only state in the Northeast with a resident breeding population of lynx, comprising the southern edge of a larger lynx population that extends into Quebec and New Brunswick. Recently, lynx have been observed in New Hampshire and Vermont including female lynx with kittens, suggesting lynx are expanding into former parts of their historic range. Canada lynx were federally listed as threatened in 2000 by the US Fish and Wildlife Service (USFWS), and although not known at the time, they were approaching peak numbers in Maine. A joint twelve-year study of lynx revealed that the extensive cutting of spruce and fir in the 1970s and 1980s following an insect outbreak benefited lynx 25-35 years later. The abundance of young dense conifer forest became ideal habitat for snowshoe hare, the principal food source for lynx, and subsequently supported larger numbers of both populations. Through the 1990s, lynx populations increased and by 2006 reached record high numbers. Current estimates suggest between 750 and 1,000 adult lynx likely occupied northern and western Maine spruce/fir flats. Bounty on lynx repealed in 1967 and hunting and trapping season closed. In 1997, lynx were designated a species of special concern because information was not sufficient to determine if lynx qualified as threatened or endangered species under Maine’s Endangered Species Act. In 1999, MDIFW and the USFWS started a 12-year telemetry study of lynx in northern Maine. In 2005, USFWS drafted an Interim Recovery Plan Outline for lynx. A recovery plan has not been finalized. In 2008, MDIFW applied for an Incidental Take Permit for the accidental capture of lynx in traps set for other legal furbearing animals. In 2011, the USFWS developed an Environmental Assessment of our permit application. Our application is still under review. In 2012, MDIFW completed a lynx species assessment (PDF) that documents the status of lynx in Maine to help guide conservation goals and management. In Maine, lynx have been protected from harvest since 1967, but are sometimes caught in traps set legally for other furbearing species. In most circumstances, lynx can be released from traps with little injury. However, occasionally lynx are killed in traps. When this occurs, IFW investigates the circumstance and if obvious correctable measures are identified, IFW modifies Maine’s trapping regulations to minimize future captures of lynx. IFW is seeking from the USFWS an incidental take permit for lynx accidentally caught in traps set for other furbearing animals. The USFWS is working with IFW to finalize our application following a public comment period. Between 2000 and 2011, 59 lynx have been caught in traps; the majority was released from traps with little injury. Lynx are occasional struck by vehicles on Maine roads and killed. Between 2000 and 2011, 27 lynx were struck by vehicles, in the last year 5 years the number of lynx struck by vehicles has doubled to approximately 3 each year. Between 1995 and 1999, the Department initiated winter track surveys to document the status of lynx and other rare carnivores along the border of Maine and Quebec. Although most towns were only surveyed once during a single winter, lynx tracks were observed in several locations (Figure 2.3-left). Track surveys conducted between 1995 and 1998 were stratified based on the acres of young forest. We found lynx in 29% of the survey areas with >2,000 acres of young forest and found lynx in 18% of the towns with <2,000 acres of young forest. 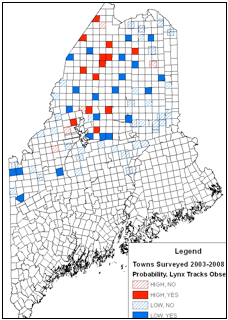 In 2003, the Department initiated more extensive snow-track surveys to document lynx distribution statewide as part of a Maine Natural Areas Program/MDIFW survey effort to document rare species and communities in Maine (i.e., ecoregional surveys; Vashon et al. 2003, 2007, and 2010). Although surveys were conducted only once each winter, lynx were found in many more northern locations. We stratified surveys conducted between 2003 and 2008 by the probability of lynx occurrence (low vs. moderate/high) from an early habitat model (Hoving 2001). 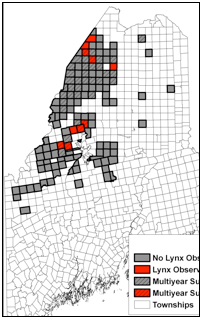 We observed lynx tracks in 50% of the survey areas that were modeled to have a low probability of lynx occurrence and observed lynx tracks in 83% of the survey areas projected to have a moderate to high probability of occurrence. Between 1999 and 2010, the USFWS and IFW conducted a study of radiocollared lynx on a 400km2 area in northern Maine to estimate the abundance of lynx in Maine, their ability to survive and reproduce, and the factors that may limit their numbers. At the time, although little was known about lynx in the northeastern United States, Maine had the most consistent evidence of lynx presence. A year after this study was initiated, lynx were federally listed as a threatened species in Maine and 13 other States. The data from this study has been instrumental in the development of conservation planning to insure the persistence of lynx in Maine. Between 1999 and 2010, we captured, equipped, and monitored 85 lynx (44 males, 41 females) with radio collars and documented the birth of 111 kittens in 42 litters. Like elsewhere, starvation and predation were the leading cause of lynx mortalities and starvation losses appear to be related to a parasite that infects the lungs making it difficult for lynx to chase and capture prey. Lynx were often found in regenerating dense stands of spruce/fir saplings where hares were most common. Lynx raised their kittens in dense forests that contained blown down trees or brush piles for den structures. Lynx reproductive success was influenced by the abundance of their prey. When snowshoe hare were common (between 1999 and 2005), most female lynx had kittens. Conversely, when snowshoe hare were less common in Maine’s regenerating spruce/fir clearcuts (2006- 2011), fewer lynx produced litters in 2007 to 2009. Although hare densities in regenerating clear cuts remained low in 2010, hare numbers increased in other stand types and all 5 radiocollared female lynx gave birth to kittens. Throughout this study, lynx occupied relatively small areas and continued to use regenerating s/f clearcuts. Habitat estimates from the Maine Forest Service and data from this study analyzed by IFW, USFWS, and the University of Maine were used to develop population estimates and habitat models to inform management planning efforts for lynx in Maine. This study was funded by IFW, USFWS, Defenders of Wildlife, Forest Products Council, Kendall Foundation, Maine Outdoor Heritage Fund, National Council of Air and Stream Improvement, Plum Creek Timberlands, Sweet Water Trust, USGS-Cooperative Fish and Wildlife Research Unit, University of Maine’s Cooperative Forestry Research Unit and the Wildlife Conservation Society. Who: Maine Department of Inland Fisheries and Wildlife (IFW) and the US Fish and Wildlife Service (USFWS). Why: Little was known about lynx in the northeastern United States. 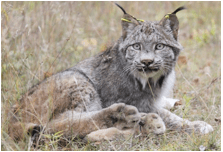 How: Captured and equipped lynx with radio collars to monitor their movement, habitat use, survival and productivity. Results: Lynx occupied relatively small areas (1/2 a township males, 1/4 township females), productivity and survival were relatively high, and lynx were often found in regenerating dense stands of spruce/fir saplings where hares were most common.